When you sew a new garment, you must prepare the fabric before you lay out and cut the pattern pieces. If you do not take the little extra bit of time to do this, you may find that your finished garment does not hang properly. It may ride up, pull and twist when you wear it. You can iron it, tug on it but no matter what you do, it will never fit right. You should always take a moment to test the fabric for the grain. All fabric has a grain which simply means the threads that make up the fabric run in two directions, horizontal and vertical. When you lay your pattern pieces, there is always a line in the pattern piece which says to place that line on the straight grain of the fabric. To understand the grain, you need to understand these basic terms. Think of a bolt of fabric. When you purchase a yard or metre, the material is pulled from the roll and laid out for cutting. Selvage: This is the side edge on the bolt. These edges have a different texture, do not fray and often have a manufacturing stamp on them. You should not lay pattern pieces to include these edges. 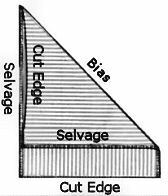 Cut Edge or Fabric End: This is the end of the fabric which has been cut off the bolt and may or may not fray depending on the type of fabric. Lengthwise Grain: runs parallel to the selvages and does not stretch. Crosswise Grain: runs perpendicular to the selvages and has a slight amount of stretch. The Fold: Wide fabric is often folded in half down the middle to fit the roll; the two selvage edges are together. So you have a length of fabric with two selvage edges and two cut edges and it may or may not have a fold. Consider two front pieces on a dress or blouse. If you lay the left front piece on the lengthwise grain of fabric and the right front piece at an angle to the first, one will have a slight stretch and one will not. When you wear the finished garment, there will be a noticeable difference in the way the two front pieces hang. One front piece will have stretch one way and the other piece will have stretch a different way. This is why it is so important to lay the fabric pieces exactly where the arrows on the pattern pieces indicate. Preshrink Fabric: Before you begin sewing or pinning pattern pieces, always wash or dry clean your fabric. It may shrink and, of course, it is better to shrink the fabric before you sew than to have it shrink after you have made your garment. Once this has been done, proceed with the next step and check the fabric grain. Check the Fabric Grain: An easy way to test the fabric grain is to fold a piece of fabric in half lengthwise and pin the selvage edges together. If the fabric lies perfectly flat, the grain is perfect. When you purchase fabric, it is important to lay it out and be sure that it is perfectly flat. Adjust the cut ends, not the selvage ends. B. If there is a noticeable pucker, you can pull the fabric on the bias in the direction it needs to be straightened.